Today’s UTT Throwback Thursday looks all the way back to…Monday, when UTT identified the threat of the Shadow Government and the penetration of America’s national security and governmental decision-making apparatus by jihadi, hard-left/Marxist, and other enemies. The resignation of General Michael Flynn is another salvo in America’s Second Civil War, which is now underway in earnest. This was a victory for our enemies and, if harsh action is not taken immediately, our enemies will be emboldened to be more aggressive. The battle lines in America’s Second Civil War have been drawn between the enemies of liberty and principles upon which our fore-fathers built this nation, against those willing to stand and defend all that is right and just about the original ideals of this land we call America as detailed in the Declaration of Independence. Those involved in General Flynn’s resignation, especially the media and individuals in the intelligence community who illegally leaked highly classified material, lied and are continuing to lie about the contacts between General Flynn and the Russians, among other details. They did this and are continuing their efforts to intentionally thwart the orders of the President of the United States, as did the judges ruling against the law on President Trump’s Executive Order regarding closing immigration from seven hostile nations. The hard-left/Marxists and Jihadis are working together to destroy the American government and society and both have overtly stated so. They are being directly aided by many media outlets and reporters as well as by establishment Republicans who seem to want to maintain status quo rather than defend the Republic and adhere to their sworn oaths to protect and defend the Constitution of the United States. Those involved and supporting such subversive activities should be identified and fired and, where possible, prosecuted. Judges ruling against U.S. law and the Constitution, including those on the Supreme Court, should be impeached. President Trump faces a true and imminently dangerous threat to the Republic, and comparisons to Lincoln’s leadership burdens during America’s first Civil War are not unfounded. For several years, UTT has been briefing and teaching leaders in law enforcement and government about the flourishing operational and strategic relationship between the international hard-left/Marxist movement and the Jihadi Movement. From the ground level in Ferguson and Dallas to the hundreds of George Soros funded organizations internationally seeking to financially bring down the United States, to the Global Islamic Movement using these organizations and individuals as tools to build their caliphate under sharia, the Flynn resignation is a major pivot point for the enemy. It shows them they can defeat the United States from the inside out. Now we have a likely prospect for the President’s new National Security Advisor in Admiral Harward. Does he strategically understand the magnitude of the threats facing the Republic, and does he have the stomach for what must be done to achieve victory? UTT reaffirms this war will be won or lost at the local level. Courageous sheriffs and pastors who will speak the truth, prepare their communities, and root out the threats facing our Constitutional Republic county by county is the second major step towards victory. The first is training and education. UTT stands ready to help your community. Good Luck with the pastor support, as many main line denominations help support themselves by settling Muslims for US Tax $$ kick backs ! ! General Michael Flynn’s Wikipedia page portrays an individual given more to expediency than hesitation when faced with fluctuating responsibilities involving duty & country, and new opportunities. Which according to General George S. Patton reflects the essence of manhood. 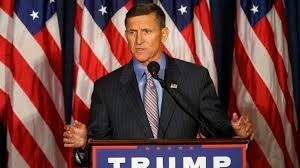 Thus the gratitude each of us owe to “the long gray line” of Americans like General Michael Flynn et al is immeasurable. Lest we forget, it is they who with their boots on the ground and a weapon in their hands have answered each call to preserve OUR lives as well as OUR freedoms. Those are America’s real heroes! Furthermore, federal employees et al who have engaged in treason and/or tactical anarchy to delegitimize Constitutionally elected U.S. officials by effectively transforming the content of “top secret” international communications I.e. property of the United States government, into the proceeds of crime under the guise of representing a “shadow government”, and incinerating & pillaging inner-cities, should be identified as fugitives by the Department of Justice and arraigned in federal courts for felony violations.